BenQ showed examples from its range of monitors for filmmakers and photographers. Features include IPS panel technology, wide colour gamut and hardware calibration features. Models are available with 4K UHD and HDR10 capability. Top of the interactive range is the 86 inch 10-touch 4K RM8601K. Canon demonstrated its C700 and C200 cameras plus a line of 4K monitors. The C700 uses a 38.1 x 20.1mm sensor offering shallow depth of field, wide field of view and 15-stop dynamic range. Sensor modes support full frame, Super 35 mm and Super 16 mm. 4K can be recorded directly to ProRes or XF-AVC formats. Alternatively, 5.9K raw or 4K ProRes files can be created using the optional Codex CDX-36150 recorder. Model C200 has a Super 35mm CMOS sensor with 8.85 megapixels. It can operate in a wide range of shooting resolutions and frame rates, all the way up to 4K/50P DCI (4,096 x 2160) Cinema raw Light and 4K UHD/50P (3,840 x, 2,160) MP4, both of which can be recorded internally. Cartoni exhibited a new 75 mm base SDS tripod and spreader support system for ultra-lightweight cameras. This combines the company's Focus 8 fluid head with a two-stage/single lever tripod and mid-level spreader technology. Holdan demonstrated Blackmagic's Pocket Cinema Camera 4K. This has a 4/3 size sensor, 13 stops of dynamic range, dual native ISO up to 25,600 and a 5 inch touchscreen. Images are recorded onto standard SD/UHS-II or CFast 2.0 cards in raw and ProRes at up to 120 frames per second. Also supplied as standard are an MFT lens mount, built-in microphones, mini XLR input, full sized HDMI, 3D LUT support, Bluetooth and a USB-C expansion port. 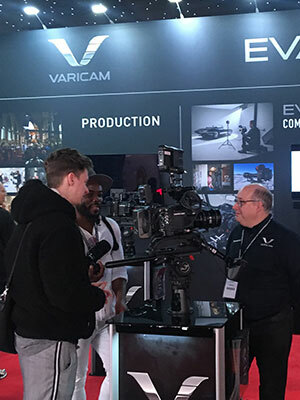 Panasonic demonstrated its AU-EVA1 and Varicam 35 cameras. The EVA AU-EVA1 has a 5.7K Super 35 mm sensor and is designed for handheld shooting. It can also be used on gimbals, drones and light jibs. Features include 14-stop dynamic range, V-Log gamma and wide-colour gamut, dual native 800/2500 ISO sensitivity and recording speeds of up to 60 frames per second in 4K or 240 frames per second in 2K. Lens mount is EF. Peli showed examples from its range of over 80 cases, all designed to protect equipment against extreme conditions. An automatic pressure equalisation valve stops moisture from entering the case and prevents vacuum-lock so it can be opened easily at any altitude. Peli's Trekpak forms a protective cocoon inside each case. The cases are waterproof and dustproof and have large grab handles for easy handling plus wheels to assist transportation. Sennheiser exhibited its line up of digital and UHF wireless microphones for video cameras, DSLR and mobile devices. The company's new XS Wireless Digital series offers an easy entry into wireless audio. The XSW-D replaces the cable with compact transmitters and receivers that work on 2.4 GHz for worldwide license-free operation. Transmitters and receivers can be freely combined. Up to five systems can be used simultaneously and have a range of up to 75 metres. The transmitter and receiver units can be recharged via USB using the included charging cable and work for up to five hours on a single charge. Sony demonstrated its FS7 II 4K camcorder. Features include electronic variable ND filtering, a lever-lock type E-mount and a new mechanical design for easier set-up. The FS7 II camcorder is compatible with Sony’s α Mount system which includes more than 70 lenses. A preset mode allows users to assign three ND settings to the filter turret. Auto ND mode can also be selected, allowing exposure to stay at a fixed level while adjusting the depth of field with iris control. The FS7 II records to an XQD memory card, available in up to 256 gigabyte capacity holding approximately 45 minutes at 4K 60P and 3.5 hours at 2K 30P. Also on the Sony stand, the FS5 camcorder is built around a 4K Super35 CMOS Sensor offering shallow depth of field, low-light sensitivity and wide field of view. Recording is 10 bit 4:2:2 in Full HD at up 50 megabits per second. Teradek demonstrated its COLR interface which combines a real-time LUT box, camera control bridge, and HDMI/SDI cross-converter in one box. COLR integrates with Pomfort's LiveGrade Pro DIT and colouring software. It is available in single and dual LUT versions. Vinten and Sachtler launched a new ground spreader for the flowtech75 and flowtech100 tripods. Intended for electronic newsgathering and electronic field production applications, the spreader connects the three tripod legs at ground level for added stability on even terrain. A foot control enables operators to extend the spreader arms to full radius. The spreader feet are removable so operators no longer have to carry a separate set of feet if they choose to use the tripod without the spreader for low-angle shots.